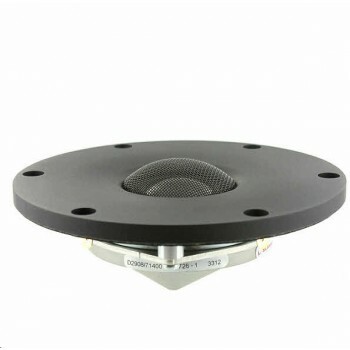 Scanspeak D2908/714000 Revelator tweeter, the premier member of the world-famous premium Revelator Range giving an extraordinary level of definition and depth. Black anodised and machined 120mm aluminium face plate and beryllium diaphragm, titanium voice coil former, 6 mounting holes. This tweeter also features a non-resonant Aluminum multiple facet chamber, low compression, all with a “SD-2" Neodymium large magnet symmetric drive motor system. Excellent wide dispersion and very low distortion and power compression, optimised air flow in the chambers. Delivery is normally 5-7 working days if not in stock. Priced per unit. Supplied in matched pairs (2 units) only.